40G Transceiver vs 100G Transceiver: Which One Is Worth the Investment? Today, the trend for high-speed data transmission and high-bandwidth is overwhelming. Some years ago, people had witnessed upgrading from 10Mbps Ethernet to 100Mbps Ethernet. And the migration from 1G to 10G was happened not very long ago. But now, whether you believe it or not, prepared or not prepared, 40G and 100G have already on the way. 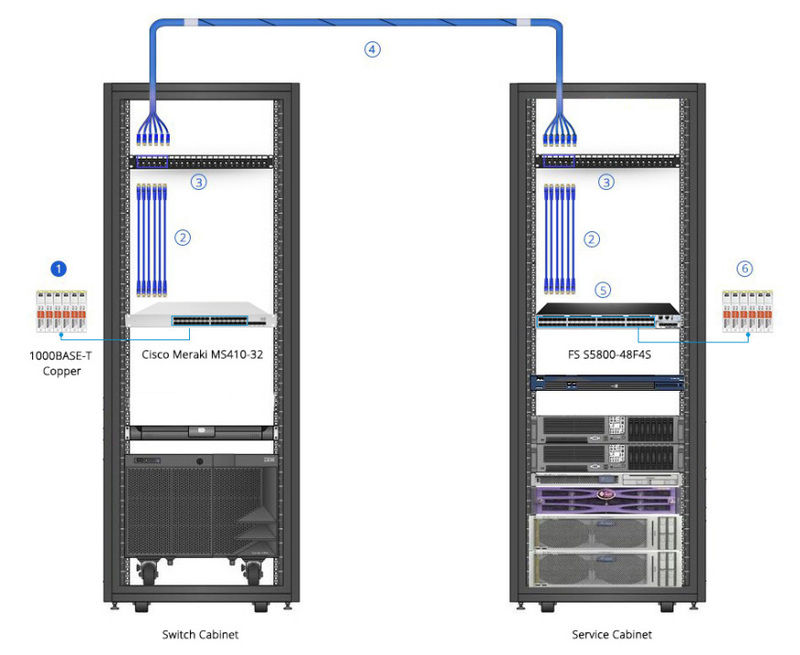 Meanwhile, 40G transceiver and 100G transceiver are widely deployed among data center managers and IT engineers. 40G transceiver vs 100G transceiver, which one is worth the investment. To begin with, it has to be made clear that the market trend is 100G Ethernet, which will eventually become the mainstream in the future. The strong demand in 100G Ethernet is being driven by cloud services and hyper-scale data centers. 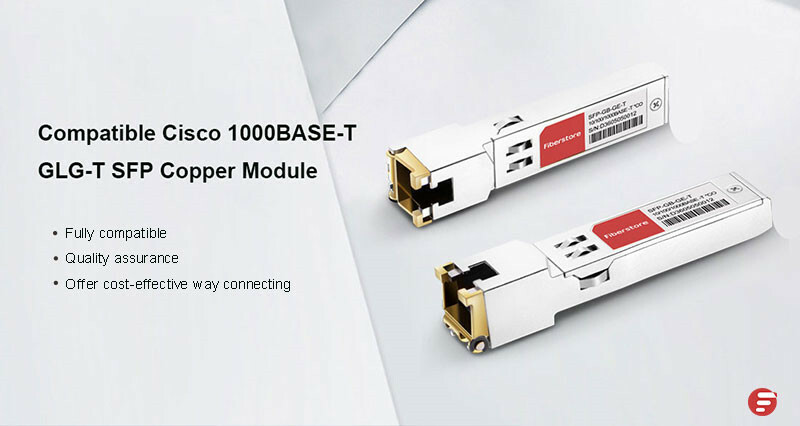 And there is a demand for lower-priced 100G pluggable transceivers from data center customers. Currently, the market transition to 100GE is in full swing, fueled primarily by the seemingly insatiable need for networking bandwidth by hyper-scale data centers and cloud services. As it has been shown in the picture below, 100G Ethernet transceivers will exceed 15 million units a year. This tremendous growth in deployments by a small number of key customers, together with a large number of suppliers competing for these orders, will undoubtedly drive down the cost of 100GE modules rapidly. 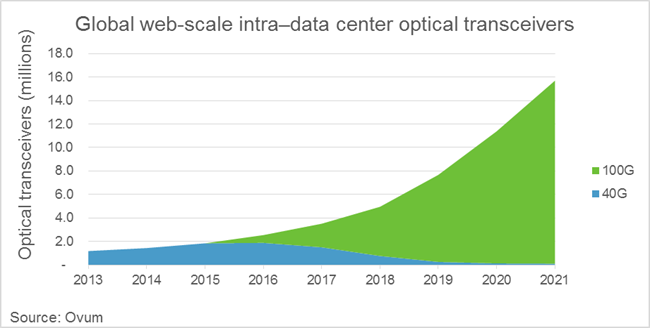 It is predicted that the cost of 100G optical transceiver is expected to decline by 75% in the next couple of years. In the meantime, Facebook has publicly set a target cost of $100 for a 100G transceiver with a reach of less than 2km. While the Facebook target appears to be years away, we believe that a 70% cost reduction in 2 years is possible. By that time, the 100G transceiver will be more affordable. If you ask me why 40G Ethernet will be obsolete? The short answer is “cost”. From the technical point, The primary issue lies in the fact that 40G Ethernet uses 4x10G signalling lanes. On UTP, 40G uses 4 pairs at 10G each. Early versions of the 40G standard used 4 pairs, but rapid advances in manufacturing developed a 4x10G WDM on a single fiber optic pair. Each 40G SFP module contains a silicon chip that performs multiplexing so that the switch see 40 gigabits in and 40 gigabits out. 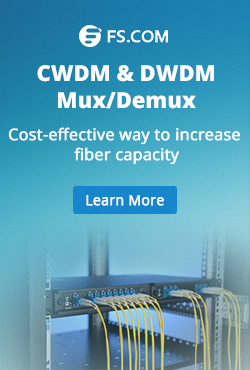 It’s similar to Coarse Wave Division Multiplexing when using fiber. 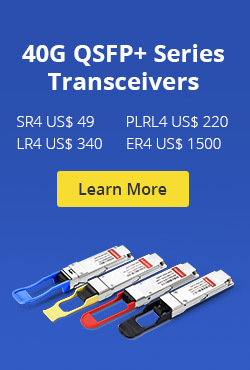 When you buy a 40G cable or QSFP, you are paying for the cost of the chip and software, plus the lasers, etc. 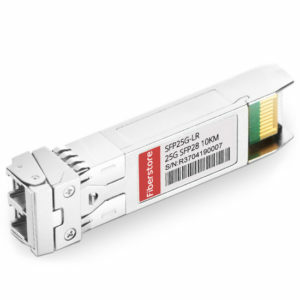 When using 25/50/100G, the “lane speed” is increased to 25 gigabits per second. For 100G Ethernet, there are four 25G signalling lanes. 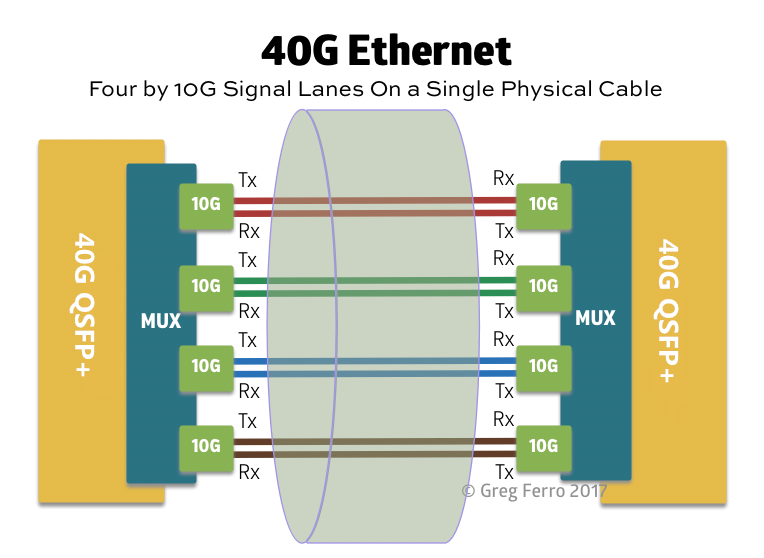 It’s cheaper to buy 100G with four lanes rather than 40G with a four-lane MUX. 100G Ethernet are racing to market and will finally takeover the 40G market. 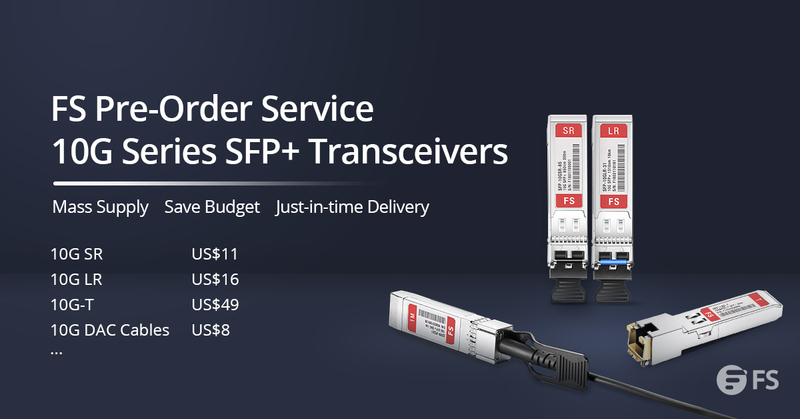 FS provides both 40G transceiver and 100G transceiver for your network deployment. 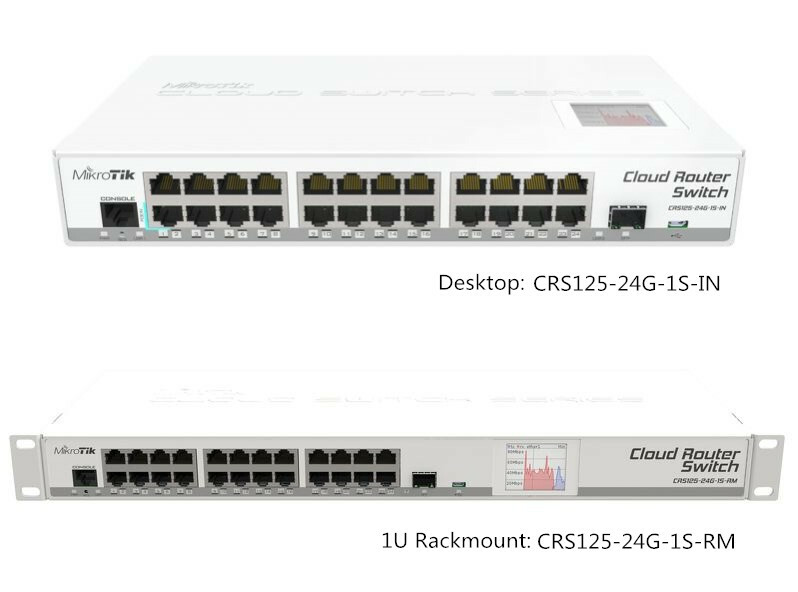 They are compatible with major brands, like Cisco, Brocade, Juniper, Dell, Arista, etc. If you had any inquiry, you can kindly visit www.fs.com. This entry was posted in Optical Transceiver Solution, WDM Optical Network and tagged 100G transceiver, 40G transceiver, 40G VS 1OOG on August 19, 2017 by Admin.